This is info for the annual Snow Camp trip of the De Anza College Outdoor Club about buying snow chains with the intention of possibly returning without use or renting snow chains. The last big town on our usual winter route into Yosemite is Mariposa. Every year they have had lots of chains rentals at the various gas stations on the main drag, but no guarantee they will have your size when you need them. We do not currently have the time to update all the prices and returns policies for this year’s snow camp trip, but this will give you a head start of you want to rent/buy. Before a previous trip I did a quick survey of snow chains purchase prices / returns policies and asked about the availability of local rentals. As in the previous year’s surveys I was told that there is too much liability involved in rentals, so no one in our area is doing it anymore, even a ski rental place that used to rent chains. But that still leaves lots of possibilities for our trip, including renting them in Mariposa (with luck). you need to find the owner’s manual and/or look at the tires on your vehicle and write down the numbers on the side. It might say something like P225-75-R15. You can’t put snow chains on some vehicles! If you have aftermarket wheels and big fat tires you might not be able to fit chains on them, as there will not be enough space in the wheel well. Some models don’t have enough clearance between the tire and the suspension, even without bigger wheels/tires. Some manufacturers don’t recommend chains or any other traction device. The speed limit in all posted chain control areas in Yosemite is 25 MPH and going much faster than that will wear out your chains faster anyway. shop around if you are on a budget and be sure to get the store to tell you their returns policy. Most local auto parts stores do not allow any returns at all or say they might if it was obvious you got the wrong size. This is because they know that people will buy chains and keep them sealed in the box, hoping they won’t need to put them on, then return them if they don’t use them. One year Mel Cotton’s (ooops, that went out of business), allowed returns with receipt and an unopened box. They allowed returns within 30 days and charged a $10 restocking fee IF YOU DID NOT — USE THEM. IF YOU CAN FIND another place that does that AND if we have good weather on the trip and you don’t need to use the chains (AND you remember to keep the receipt and not open the box), then you could return them and get your money back. The drawback to this is that you can’t try putting on the chains in advance to get used to doing it and be certain they are the right size. Chains are of uniform size, tires vary in size by manufacturer. W______ Auto had a policy that allowed you to try them on. You could return them within 24 hours, obviously unused, and get a full refund. After 24 hours there was a $20 restocking fee for unused chains. But a club officer told me that more recently, if you return after 24 hours you lose 50% of the value. That is a pretty hefty restocking fee. Our local NAPA and Kragen’s did not allow returns. Both local Pep Boys I tried calling did not answer their phone after 20 rings, so I don’t know their current policy, but a few years ago they did not allow returns. Another place sold only cables and the guy tried to tell me my vehicle has ABS (anti-lock braking system) and therefore cables are preferred. That Jeep did not have ABS and no one I’ve talked to about it says that cables would be preferred. I have a straight “A” grade average in automotive technology classes here at De Anza and I get especially tired of clerks who don’t know what they are doing and should not be answering the phone, or who try to treat female customers as if we are incapable of understanding simple principles. If you get someone who treats you as if you are incompetent, let the manager know and go to another store. ALL these policies could change by the time you go to get/rent your snow chains. Get the policy in writing from the store. Don’t put off this purchase until the last minute, as some places that do carry chains run out by mid-winter. Besides the chains, do you also need new wiper blades, deicing fluid for the windshield washer tank, a windshield scraper or deicer? Pack something to kneel on when you are putting the chains on. Is it time for new antifreeze or a brake job? Do the defroster and heater actually function? Do you know how to use your jack and is it still in the car? Keep at least a half-full gas tank (to prevent gas line freezeup). Why? Any space above the gas in the tank has moist air in it. In the cold, especially overnight, that can condense into water. The water will sink to the bottom of the tank and if enough builds up it can end up going to your fuel line and cause hard starting or even block the fuel line completely. 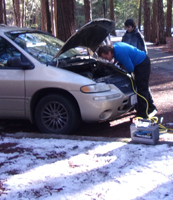 One year one of the most popular people on the annual Yosemite snow camp was a woman who brought what must have been a 20-pound bag of cat litter to get cars’ tires unstuck. Yes, the men tried to muscle the car unstuck first. Yes, she said “I told you so.” Buy simple, non-clumping, unscented cat litter or bring sand. In an emergency you could put your floor mats under the drive wheels. Hey, lots of people lock their keys in the running vehicle when they stop to put on chains! A spare set of keys in your or someone else’s pocket could be a wise investment. Read the chain instructions, do they tell you to stop and retighten after 1/4 to 1/2 mile? Next time you all get into the car, have each person take a seat, then kick their feet together outside of the car to knock excess snow off before they swing their legs in. Less snow melting in the vehicle also means less moisture in the car and less fog on the windows.